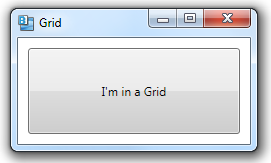 If you define a Grid, but do not define any rows or columns using the RowDefinitions and ColumnDefinitions properties, the resulting grid will contain a single row and a single column. Similarly, if you define a Grid and specify multiple columns using the ColumnDefinitions property, but not the RowDefinitions property, you’ll get a single row and the specified number of columns. (The same is true for a single column and explicit number of rows).